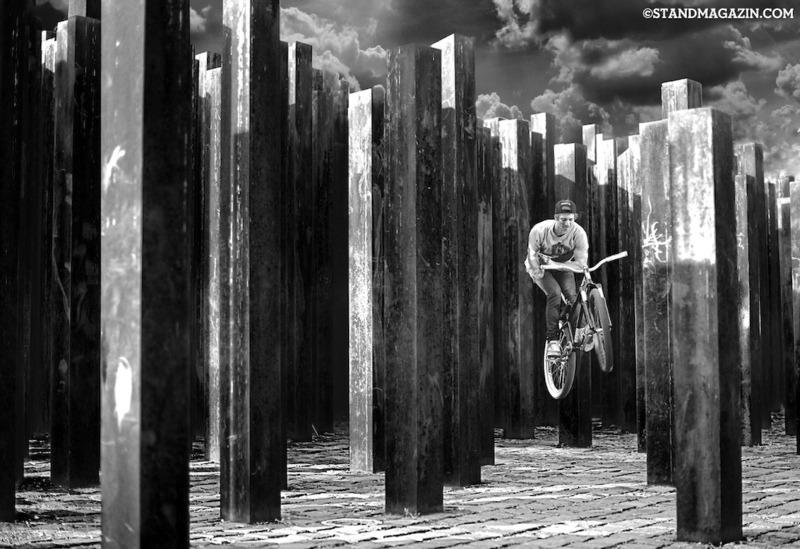 Selected by Matt Wragg - This puts me in mind of Sterling Lorences classic shot of Matt Hunter jumping through the trees, but re-imagined on an urban landscape. What happened to the no helmet no POD rule? You don't actually need a helmet if you have nothing up there to protect... why do you think park bmx'ers care so little about them? Wow! You actually think that? The 'No Helmet POD Rule' hasn't been around for years anymore. It only lasted for about half a year or so.. I wouldn't mind to hit u L0rd Tom. Even tho I disagree with what L0rdTom said, when people like KempeleenPoika reply to it in such an aggressive way, they only prove L0rdTom right. Also I interpreted L0rdTom's comment as a joke, as obviously dumb people have brains too. Dumb people have brains, they just choose not tu use them! There are people too dumb to understand jokes! your comments get down voted because troll. Helmets aren't always necessary. Riding street/park at low speed doesn't warrant a helmet in my opinion. I wear a full face for DH because it's harder to bail at high speeds and avoid trees. At the park there's little speed and if I get it wrong I jump off and ditch the bike. Except for the fact that generally the worst injuries happen on the smallest/easiest tricks and silliest moments, because you're not having 110% focus on those moments. just because you dont have the skill to attempt a hop bar w/o A SINGLE DOUBT running though your head that youre not going to loop out and hit your head...DOES NOT MEAN THAT EVERY SINGLE BIKE RIDER IN THE WORLD HAS THAT SAME FEAR OR THE SAME LACK OF SKILL AS YOU DO. get over yourself. ride a bike. with or without a helmet. its your choice. It's not a question of skill, accidents happen to everyone. No matter how good a rider you are/think you are it pays to wear a helmet. It's free choice but the statistics are there to prove it. That's a fair point and I respect your opinion, just like I'd like my opinion and everyone else's to be respected. Can you all hand-on-heart say that you wear your helmet at all times? Even just to the shop/round the block? its only a bunny hop! oh, youve never said anything or done anything disrespectful on here before? pipe down. hes not damaging/grinding on anything.. i dont see an issue. go back to posting questionable pictures of yourself. In this case there's a big difference between a grave an this memorial: this memorial is open to public and you are allowed to walk there between the piles. So it's not disrespectful to be on that place. While it is disrespectful to walk over a grave. To take a picture of a bunnyhop trick there isn't either in my opinion, but I can see how some people have different opinions on that. Also it really depends on the memorial, but in this case (been there myself) I think it's fine. A memorial is an object which serves as a focus for memory of something, well this picture is doing just that for those that have not visited it. I don't think his intention was to be disrespectful and there is no harm to the memorial. I think it was done tastefully, the lighting with the black and white almost seems like a tribute to me. Good shot but am I the only one who thinks he looks like he's been photoshopped in ? Something seems a lil fishy but what do I know about photography? Looks quite nice either way though. lighting on the rider looks totally different. Pretty sure it's just flashes. I'm guessing two flashes, one from left behind (low), and one from the right (about 1m height)? I am really struggling to believe that two flashes on the rider wouldn't have somehow thrown at least a hint of irregular shadow on one of those posts. And the lighting on the clouds makes it appear as though the sun is above or behind them when the post shadows are long and make the light source appear to be somewhere from the top left of the photo. If it's legit, well done. If not an overlay, I suspect it went through heavy post to get this effect. The more you look at it the less sense it makes. Good points above. Bud. That sky is not legit. The WHY seems to be that he thought it made for a better image. Looks like he was right because here we are commenting on a POD. The rider I'm still iffy on but am inclined to give it the benefit of the doubt because taping flashes to the poles would be easy enough. Not that the subject was necessarily Photoshopped in, but the light on him is VERY UN-natural. He probably was captured there, but someone got a little crazy with the dodge tool. Still a cool shot, but a little heavy handed with the Photoshop post-production. Did you just read that off the description? No I didn't actually , it was the 1st thing that come into my mind even from the thumb nail. Yeah... that sky is definitely dropped in. A few of those posts clearly have their tops cut off & have weird notches out of them. Makes me suspicious of the rider as well. no shadows are cast by the rider/bike.... looks fishy to me. Saw the picture on Instagram, and instantly thought of the Sterling Lorence pic, then saw you had already wrote that in the description Matt Wragg, amazing location and really awesome shot. Someone replenish the props of this thread! Epic shot by the way! Sweet Pic! Nice use of Black and white! Why do his tires look so fat?? Really a crazy picture though. It's a WW2 memorial place in Budapest, Hungary, the "square pipes" simbolizes the victims of war. It's not a WW2 memorial man! It is the memorial of the revolution of 1956. @jOKE-BIKE Sorry you're right! Shame on me.